Being one of the largest mall in the world, 1Utama sure does have so many food places for us to try. 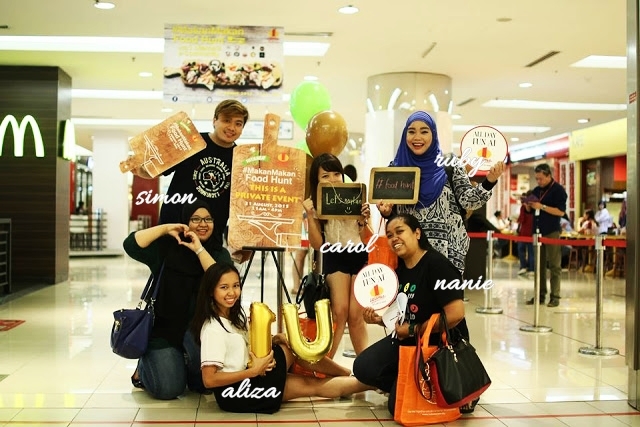 When I got invited for their Makan Makan Food Hunt, just for that day in a matter of just a few hours I tried eight different food places there! It was such a crazy day but I definitely have nothing to complain about it. I joined another five bloggers where we spent hours together trying good foods from places from The Library Coffee Bar, Bisou Bake Shop, Myeongdong Tteokpokki, Nana's Green Tea; The Little Fat Duck; MooCow; Quiznos and Betjeman and Barton. There were supposed to be another to outlet to visit which were Oh Bahn Mi and Coco Curry House but they are non halal so I skipped those two. Introducing my team members from 'Jio Makan'; Simon, Aliza, Carol, Sis Ruby and Sis Nanie. Now, without further ado, get ready to get your stomach rumbling! The first stop for the day was The Library Coffee Bar which is not something new to me. I have actually checked out their other outlet when I first heard that they have the library concept. For a book lover like me I can't help it when my feet dragged me there. Anyway, the branch in 1Utama is more of an open air concept compared to the first one. I love their overall interior that feels private and calm. Hanging out here after a long day of shopping seems like a great idea. If your husband or dad is the type who does not fancy shopping as much as you are it would be a great idea to let them have coffee and read here. Since our group consisted of six bloggers, we were able to order different menu and try a bit of each. I didn't take my breakfast the morning of the event so I was really hungry when we were there. For myself, I ordered a hot Hazelnut Latte which in my opinion is really good. The Humming Ham bites were definitely one of my favourite from everything we tried there since it's crispy and flavourful. The Magma Choc was unfortunately a dissapointment with no 'chocolate lava' when we split the cake. The portions of the dishes are big and will definitely be a full filling meal for one, and big enough if you want to share too. Out of all dishes there, the Fish Arabiata spaghetti left quite an impression on me with its spiciness. It was unexpected to have the spaghetti to be that spicy but I ended up liking it. I have always wanted to try Bisou's cupcakes every time I passed by their branches. The main attraction point of Bisou to me is definitely its cute decor that gives out a princess-ey feel. Their cupcakes are too cute too so I was really excited when I saw Bisou as one of the stops for the day. It's not hard to find where Bisou is located in 1Utama as it's right in front of crowds favourite store Cotton On. We were greeted by their manager as we arrived at this cute store and as soon as we finished ordering, every one started to snap pictures and finding nice angle. I was getting really thirsty after the hot hazelnut latte that I had previously so I ordered another drink, this time cold. I hope I'm not wrong since I actually forgot to take note of the drink name but I think it's called Sparkling Passion. It took us some time to finish taking pictures especially with the cute cakes and cupcakes! The manager was especially recommending the Rainbow Cake slice but personally I love the Red Velvet better. Well, I always love red velvet cake so this might be something totally bias, LOL. Their Hot Chocolate was so good! It's especially good to me as it's not too sweet thus complement the sweetness of the cakes better. I would definitely return even if its just to have that delicious chocolate taste once again! The number one representative of Korean street food is definitely ddeokbokki/tteokpokki/tokpokki (romanization of the Korean word). The rice cakes cooked in spicy sauce with fishcakes and boiled eggs would definitely open up a new world for you. I've tried a lot of ddeokbokki in Malaysia but so far Myeondong Topokki served the best one! The rice cakes are so chewy and not tough, the spicy level is just too my liking (might not be very spicy to some as I have low tolerance with spiciness despite my love for them). I also finally got to try the Gimmari which is a deep fried Korean spring roll with seaweed. The filling reminds me of one of my favourite Korean food, Japchae (Korean Stir Fry Glass Noodle) which I think it actually is. Dipping the crispy goodness into the ddeokbokki sauce made it taste even better. We also got to try Korean canned drink. As for me, I only got to try the pear juice but since I've had the other two in the past I wasn't sad about it. Their drinks are good! You should try the Sikhae/Sikhye or Rice Punch Drink which is actually a similar to our Barley drink. Another famous street food in Korea is definitely Eomuk or some call Odeng which is basically a skewered fish cakes cooked in broth. It's super good and addicting to me! The portion on one skewer was big enough for one person so the price is actually quite affordable. For dessert after the Korean foods, we stopped by Nana's Green Tea! I've been here before with one of my best friend Qila and I loved their Green Tea Latte but that day we tried their parfait instead. My group only ordered two parfait, one Green Tea and another one Black Sesame since the portion are just huge! I really love green tea but the green tea taste in the parfait was too strong to my liking. I think if it's less bitter it would be just perfect. I am not a fan of black sesame ice-cream and doesn't really know how it actually taste so I might not be qualified to say anything about it. Personally, it's not my favourite. The first thing that came across my mind when I was reading the Little Fat Duck Menu was how cheap their dishes are! The spaghetti are priced at RM6 and considering the price and portion it's such a bargain. We tried the Carbonara spaghetti which was not bad at all. I especially love the tender Chicken Confit which is served with mashed potatoes. It's so soft to the point it literally crumble with just a slight nudge from my fork. The chicken is also big! One of my team member ordered Grilled Fish which looked good too but I didn't get a chance to try it since we were rushing to the next place. Froyo (frozen yogurt) is one of human finest creation and that is why the frozen yogurt from Moocow always make me happy! I love eating them plain or with toppings. As I'm thinking about Moocow's goodness my mouth starts salivating already! I had dried cranberries and strawberry flavoured candy topping that day and they really go well with each other. The yogurt drink was good too! I took them home and drank them as I was editing pictures for this post and wished I've bought some extras home. I've never actually heard of Quiznos before but based on first impression, it reminds me of a fast food chain store. I took an effort to check out their website when I got home after visiting Quiznos and I found out that it actually an international chains with branches in a lot of countries. They serve a variety of pizzas and toasted subs and I especially love their pizza and the cheese stick. The portion is big so it's actually quite worth it if you go and share. Plus, foods does taste better when we share it right? Betjeman and Barton is not something foreign to me. I've been to the elegant looking store for quite a few times already and I even blogged about them HERE and HERE. I love the interior with bright red coloured wall and arrangements of tea cans on the shelves. As a matter of fact, I ended up liking teas even more these days since I visited them a few times already. Super in love with the different type of tea they serve and the fragrance and taste are also different based on the type and price of the tea leaves and mix. I'm so glad that we got to choose the tea that we want and all four are something I haven't tried yet. We ended up choosing the Malesherbes and the Rooibush Cranberry Acerola which has a more feminine and sweet smell. I especially love the smell of the Malesherbes which consist of passion fruit, bush peach, wild strawberries and enhanced with red rose petals and bits of strawberries; it is originated from China. Taste wise I actually love both! The Rooibush Cranberry Acerola from South Africa contains an excellent rooibush with notes of cranberry, acerola, lemon grass and hints of Apple. We were also served with a variety of desserts and I was really happy to be able to have their macaroon again! I especially love their Raspberry macaroon which I did mentioned in my other post. I was almost in a food coma at that point but thankfully the comfortable ambiance in the store let me relax while I continue my chit chats with the team. We ended the day with Betjemen and Barton as the last stop but overall it was definitely a fun day. I would like to thank 1Utama for inviting me to such an exciting day food hunt and also a big thank you to all the restaurants! 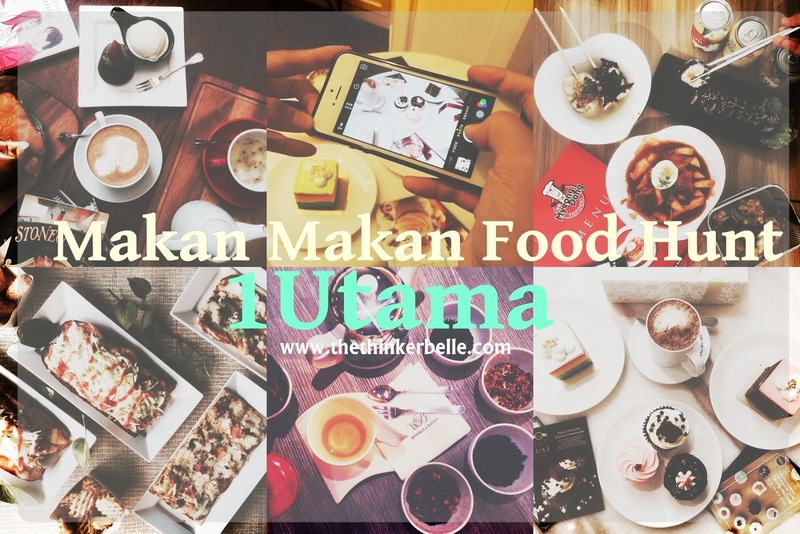 You can check out more about each food stops by visiting 1Utama website at www.1utama.com.my and like their Facebook page for more interesting news and exciting updates!